Automated "piece picking" – the selection of individual items rather than a case or pallet – has been something of the Holy Grail for distribution center automation, especially in the ecommerce world, which requires the relatively expensive piece picking process for order fulfillment. It's no wonder then that Amazon has held several of what it calls its "robotic picking challenges," in which engineering teams from around the world compete to see which robot can more successfully pick an unusual series of items from a plastic tote. A number of start-ups as well as larger materials handling companies are naturally pursuing automated piece picking solutions. Start-up companies in this area including I Am Robotics and RightHand Robotics, among several others. One major challenge with automated piece picking is that different products are most successfully selected by different types of "grippers," say more of a suction type device versus others that work best using a finger-like grabber. Most robotics companies select one or another gripper technology, limiting the range of what can be most successfully grabbed. Now, engineers at the University of California Berkeley have come up with what might seem like an obvious if new to market approach: an ambidextrous robot that has two arms (instead of the usual single arm), each of which has a different grabbing mechanism at its end. And of course in today's world, the engineers add in some artificial intelligence to determine which of the grabbers should be used for each item. "Any single gripper cannot handle all objects," said Jeff Mahler, a postdoctoral researcher at UC Berkeley and lead author of a new paper describing the advance, published recently in Science Robotics. "For example, a suction cup cannot create a seal on porous objects such as clothing, and parallel-jaw grippers may not be able to reach both sides of some tools and toys. Ambidextrous robots offer greater diversity." For the robots, new algorithms were developed to compute robust robot pick points, enabling robot grasping of a diverse range of products without training, the Berkeley engineers say. The robotic systems used in most ecommerce fulfillment centers currently use suction grippers, which can limit the range of objects they can grasp. 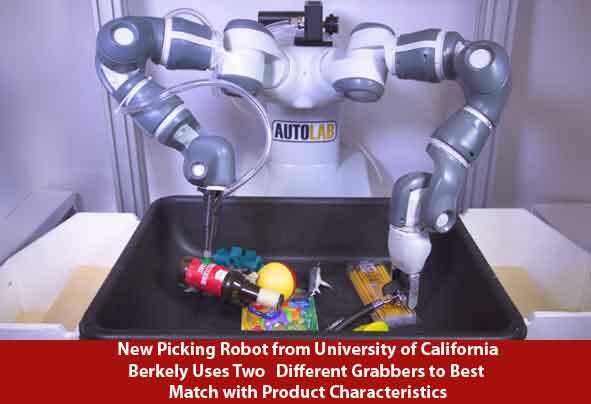 The UC Berkeley paper introduces an "ambidextrous" approach that addresses these limitations by being compatible with a variety of gripper types. The approach introduces a common framework based on a common "reward function" for each gripper type that quantifies the probability that each gripper will succeed. This allows the system to rapidly decide which gripper to use for each situation. When the researchers trained reward functions for a parallel-jaw gripper and a suction cup gripper on a two-armed robot, they found that their system cleared bins with up to 25 previously unseen objects at an amazing rate of over 300 picks per hour with 95% reliability. "When you are in a warehouse putting together packages for delivery, objects vary considerably," said lab of Ken Goldberg, a UC Berkeley professor whose lab developed the robot. "We need a variety of grippers to handle a variety of objects." What do you think of this picking innovation? Let us know your thoughts at the Feedback section below.